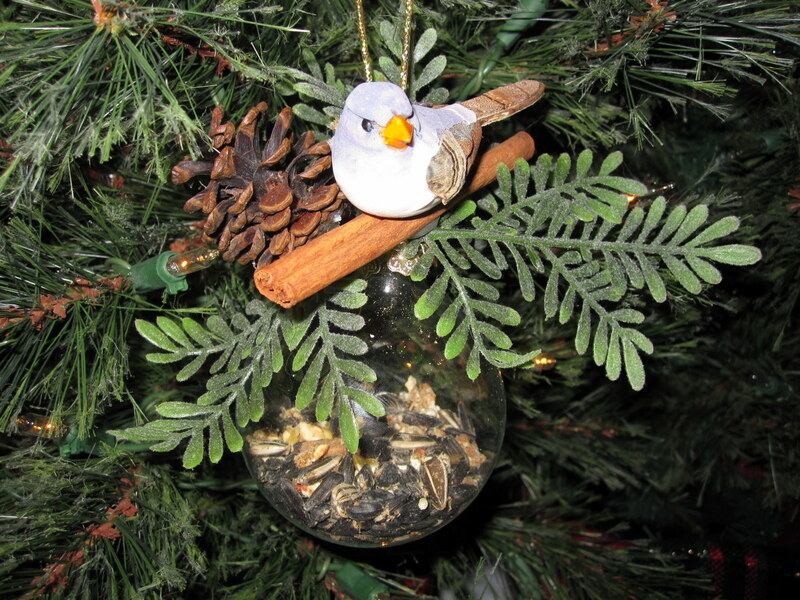 What Are the Seasons for Puffball Ornaments? 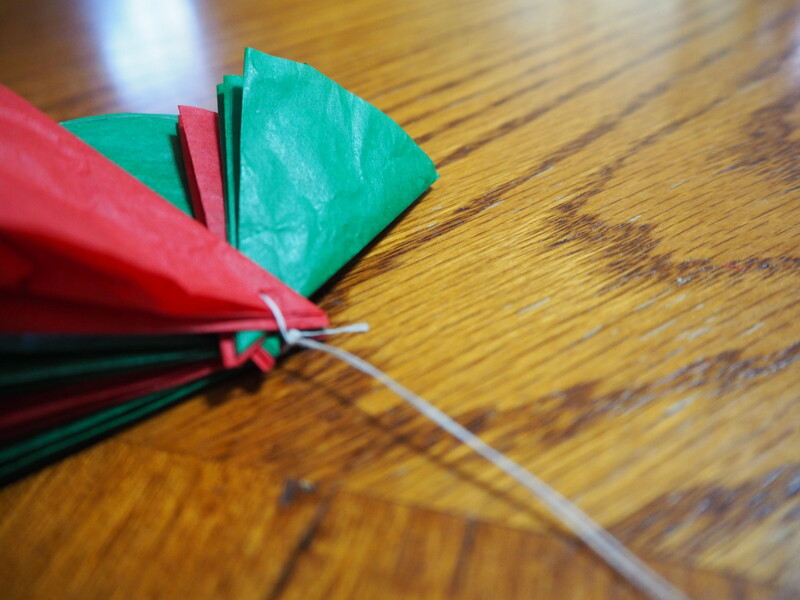 I first learned about these as Christmas ornaments, but you can adapt them to any holiday or celebration simply by changing up the colors. 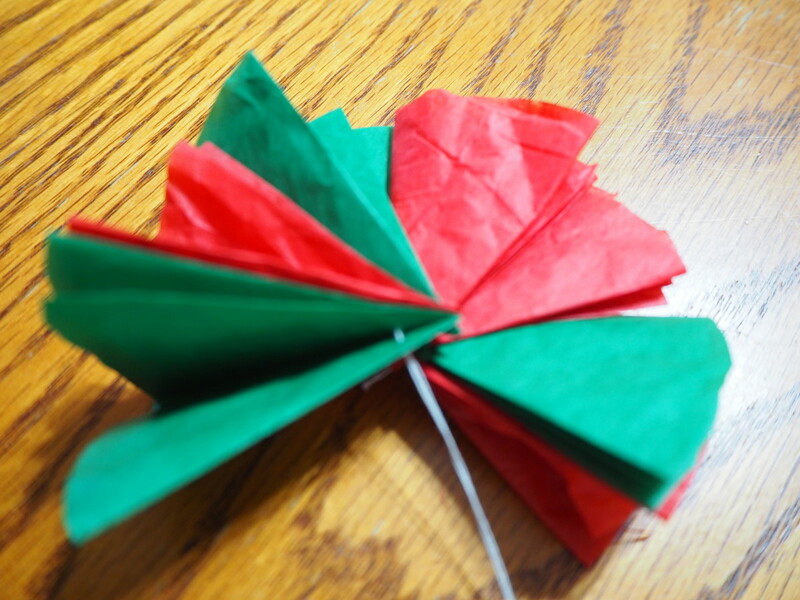 Red, green, and white, of course, are traditional for Christmas. Gold, white, silver, and black could well be used for either a 50th-anniversary party or for New Year's Eve. There is red, white, and pink for Valentine's; black and orange for Halloween, the celebrant's favorite colors for a birthday, and so forth. The first thing you need to do is decide the size of tissue ball you want to end up with. There are size limits in both directions. Too large, and you won't have the necessary stiffness to make them stay puffed out; too small, and you won't be able to open them up all the way. About 4 to 6 inches in diameter is about the largest; and you don't want to try to go smaller than 3 inches. You can use all white tissue, glitter tissue, assorted colored tissue, or a mix of colors. 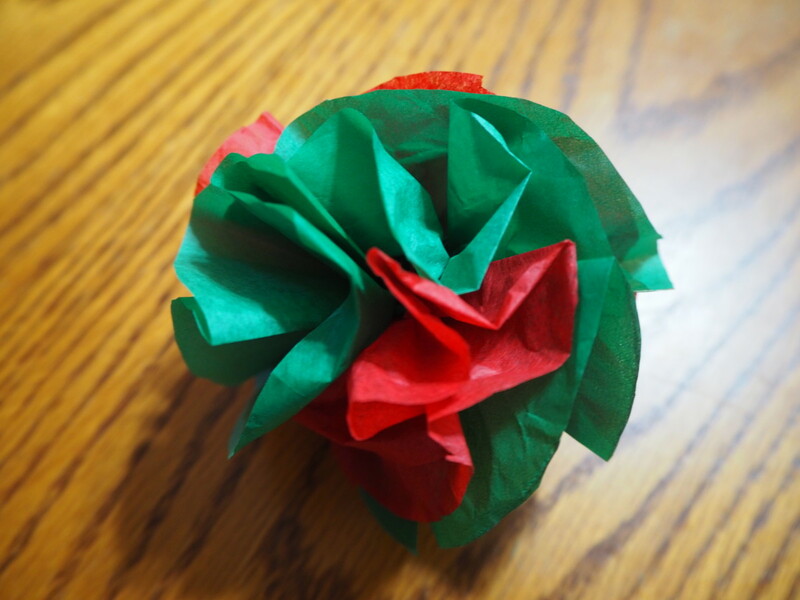 Begin by stacking or folding the tissue paper into 8 thicknesses, a little larger than the size circle you have chosen. Note--if using a drawing compass, be sure to work on a cutting mat of some kind to protect the table from the sharp point. Set aside until in sets of 8, and sort by color, if desired. Finished folded circles; now rounded-end triangles! Now, stick the needle through near, but not right at, the pointed end of each folded circle. You don't want it so close to the fold that it will rip out. Work the paper circle off the needle and onto the thread until each of the eight circles have been pushed onto the thread. 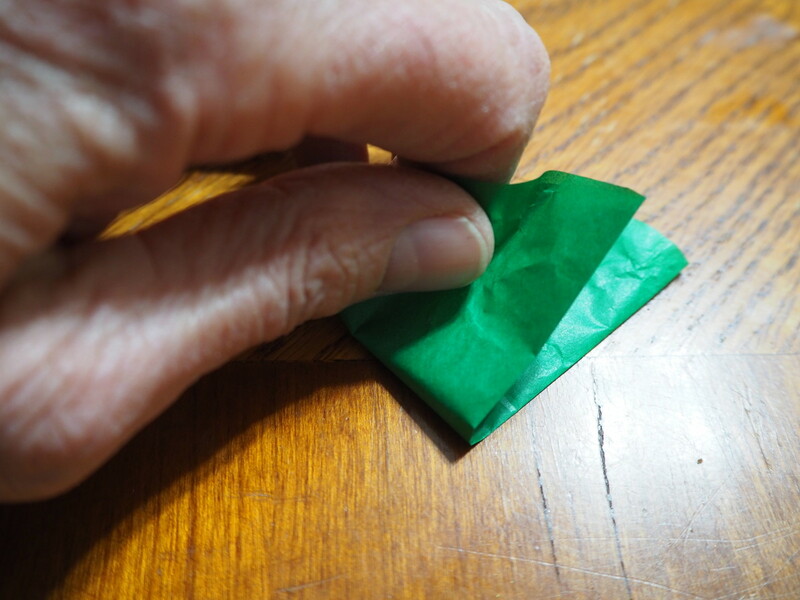 Be sure the 'open' ends of the folded papers are all threaded on facing the same direction. To fasten, pull up just a tiny bit of slack from the starting end, and push the needle through the loop below the knot a couple of times, essentially tying another knot to fasten the thread ends together. Pull up snugly, but carefully. Next, snip the thread about 3 inches above the finished strung tissues, and tie the ends together in a double knot, leaving a loop for hanging. Begin threading the folded tissues onto the needle and thread. Slip the needle through the starting loop a couple of times to fasten. Pull up snugly, but carefully, and snip thread about 3 or 4 inches from the tissues, and make a knot in that end. 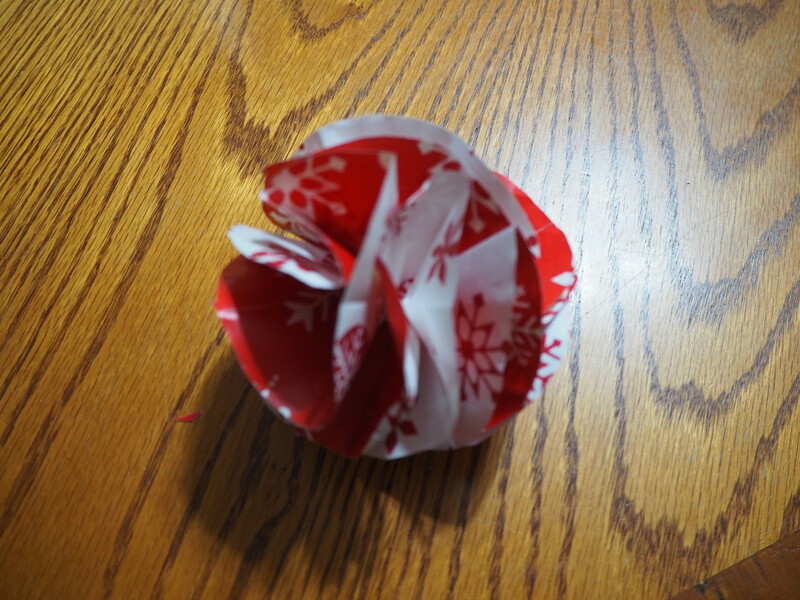 Working carefully so as not to tear the tissue, go around and unfold each of the circles as far as you can manage. You don't want to pull against the threaded end, for they may tear. Just gently tease them open, until they are all opened up. Gently fluff them, and you have one finished puffball ornament, ready to hang. 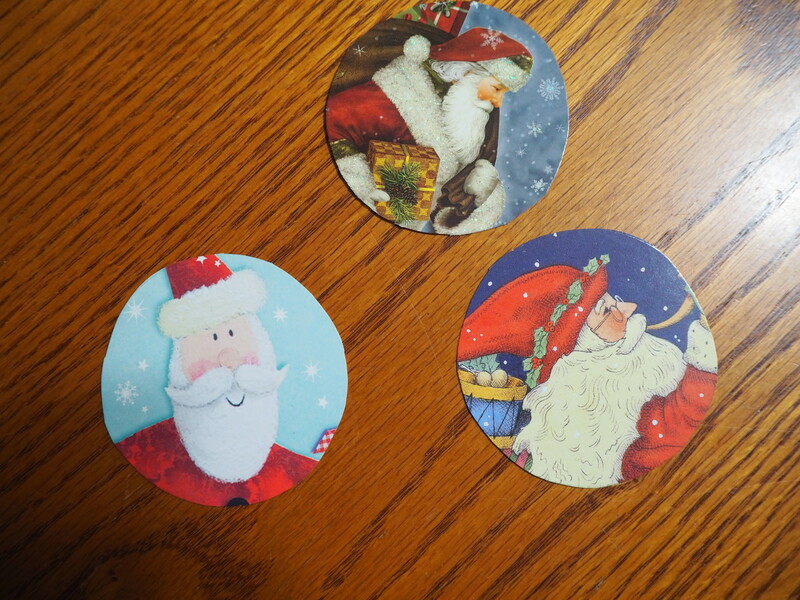 Lightweight double-side printed holiday paper can also be used. If you want to get a bit fancier, you can put glitter on the outer edges of the circles. However, this option becomes "step one," and knocks all the other steps up one number. 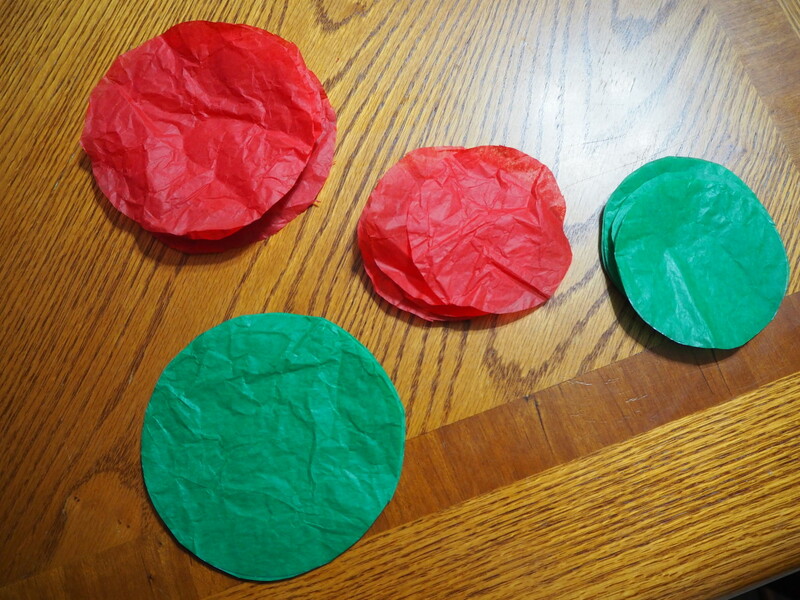 You'd want to run a bead of glue around the circles while they are still flat. Then, dip in glitter. After this, however, you need to place them to dry flat without stacking them. Alternately, use a glitter pen, which applies the glue and glitter in a single step. This is probably easier for children to do. 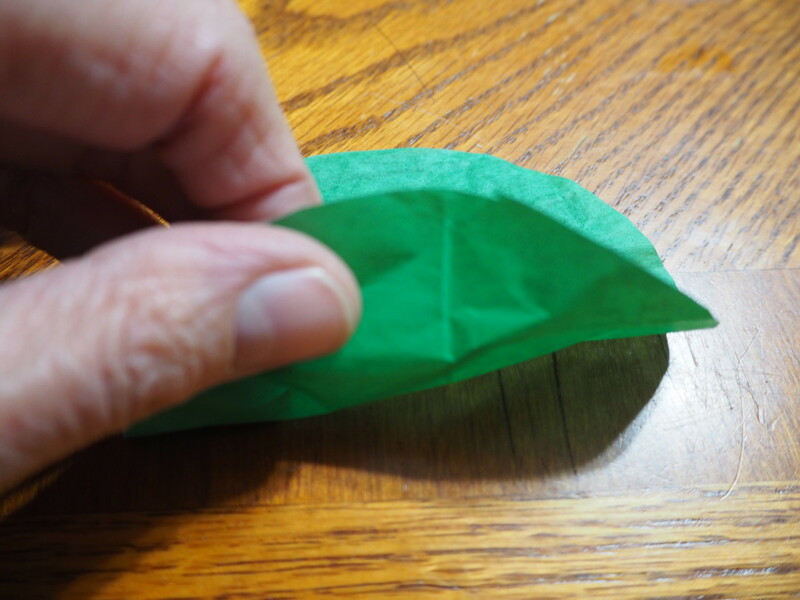 Proceed with the folding and threading after the glue is fully dry. Depending on the weather and temperature, this could take up to a couple of hours, so it's a good do-ahead step if young children with zero tolerance for delays are involved. Note: as you can see from the first photo, I used recycled tissue. It doesn't work quite as well, or open up as crisply as does new tissue, but I used what was on hand. If you are a saver of holiday cards, you already have what you need. Otherwise, you might need to ask other friends or family members if they have any. Most people who save them usually have some 'crafty purpose' in mind. It's just a matter of getting around to it, as with many things. Sort the cards by design elements, if you want each ornament to have an independent theme. You could mix and match, if you wanted; the choice is yours. This author prefers things to match. 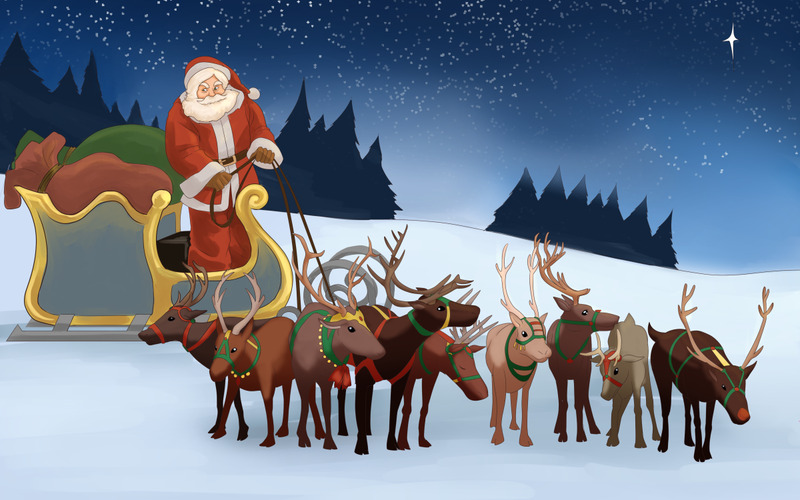 Make separate piles for Santas, snowflakes, animals (sub-sort by type of animal, if desired), sleighs, etc. Next, decide on the size you want your ornament to be. This is obviously limited by the size of the card, and the size of the design you want to use. It is therefore also advisable to pre-sort by this parameter as well. Once you have chosen your cards and designs, it's time to cut them out. Choose a drinking glass of a suitable size to contain your design, and fit within the borders of the cardstock paper. This is the best tool for this part of the job, because you can see through it to line up exactly what part of the design you want to use. 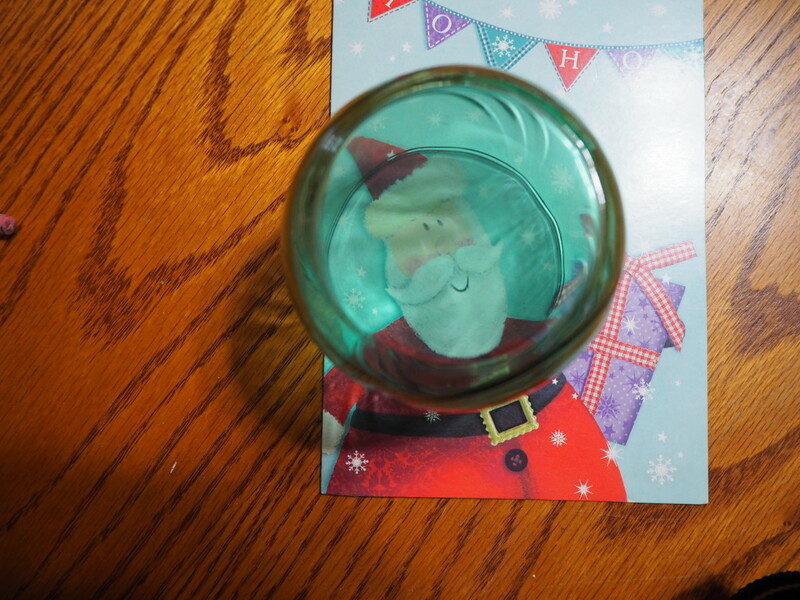 Just be sure not to let the glass go off the edge of the card, or you will have a flat spot on your finished ornament. And, image three, all lined up. Once you have decided the alignment you want, use your pencil to trace all the way around the edge of the glass. Be careful not to let the glass slide as you move the pencil. With all the tracing done, it's time for the scissors. Carefully cut around each image, staying right on top of your penciled lines. If the pencil did slip, and make a stray mark, be careful not to get fooled and cut into the middle of your design. Marks that stray to the outside can simply be ignored, but depending on the type of finish on the card, marks in the middle may be difficult to remove without damaging the picture. 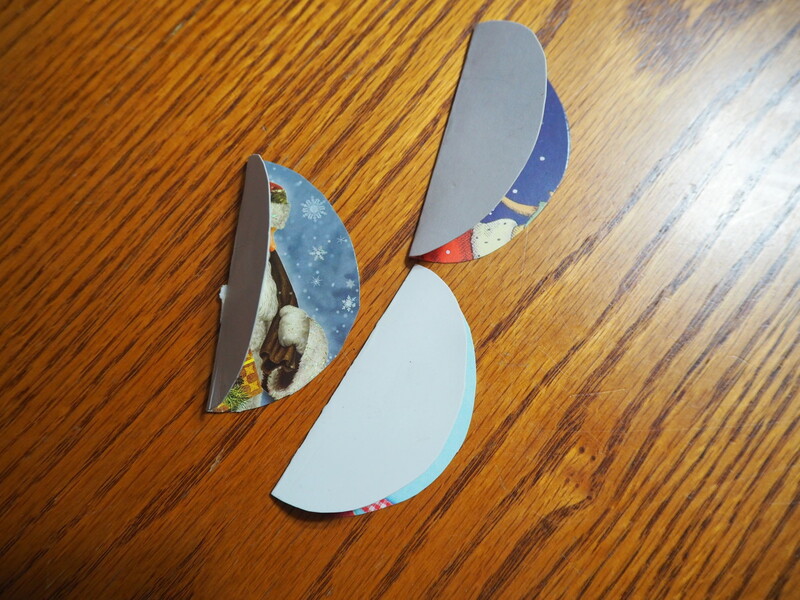 Circles cut from cards; you're halfway done! 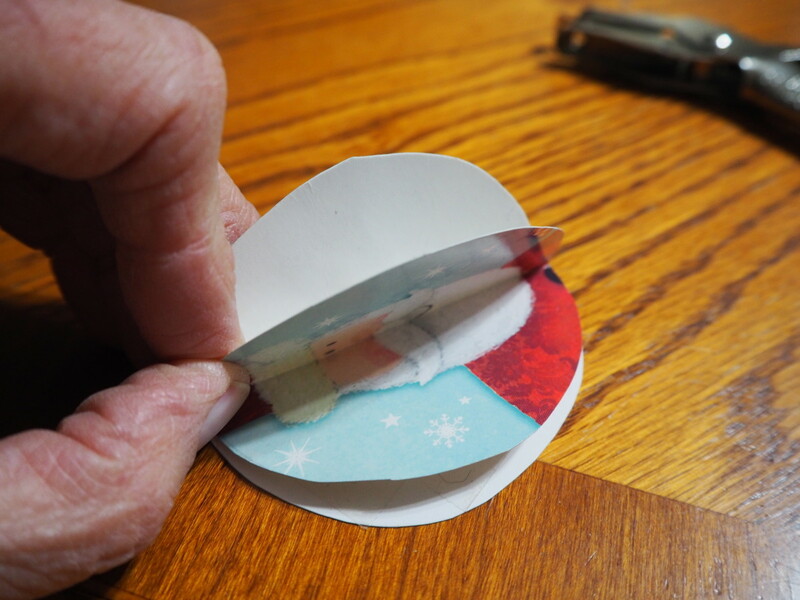 Very carefully--this can be tricky--fold the cut outs in half, picture side in. 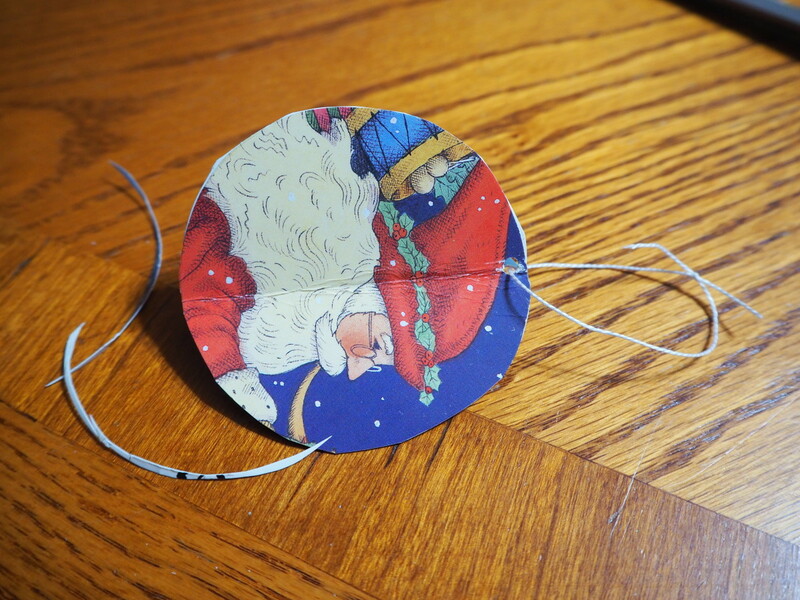 Make sure you fold on the vertical of the image, so it is right-side up; you don't want it sideways on your finished ornament. Depending on the thickness of the card stock, getting an accurate fold might be too tricky for young children; an adult can help with this. It is harder with thicker cards. 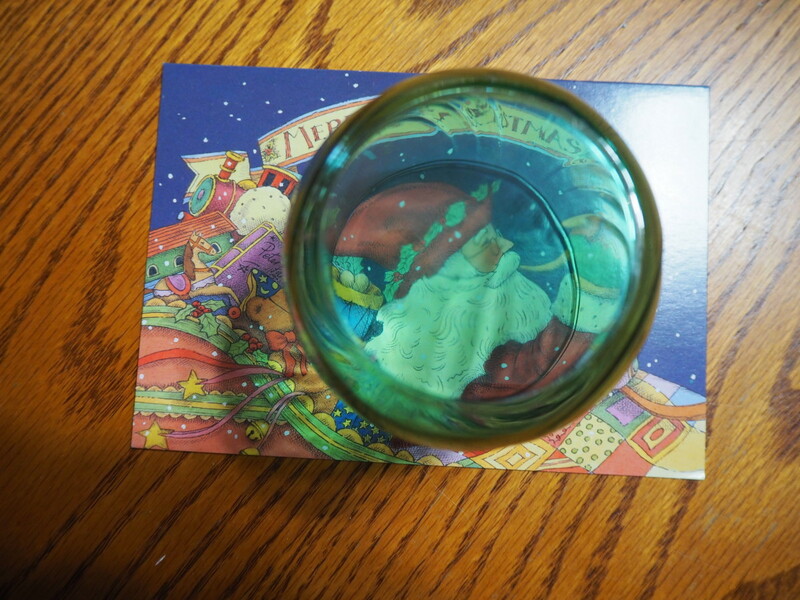 In the photo below, you can see a "blowout" on the fold of the leftmost circle, because this was a thick card. It doesn't matter, as it will be hidden on the finished ornament, but it illustrates my point. Making sure the picture is right-side-up, carefully fold the circles in half, printed side in. Now comes the glue stick. 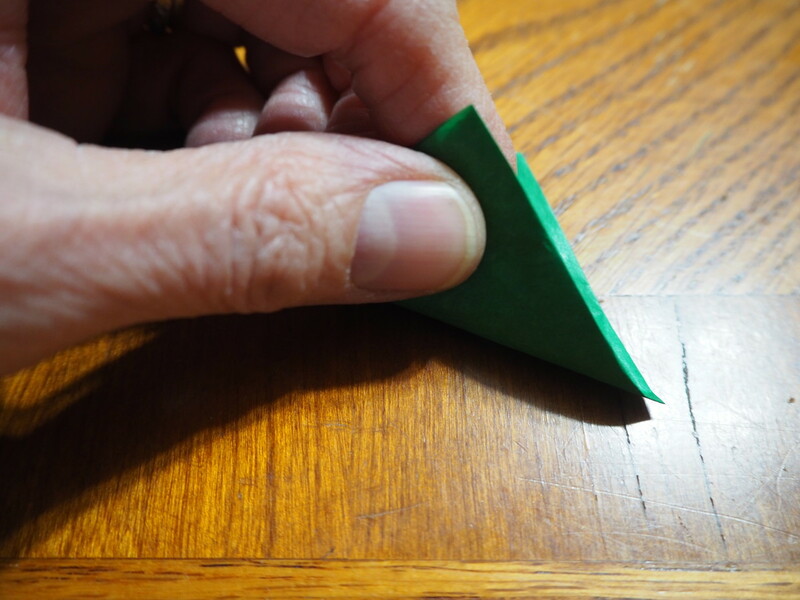 carefully run the glue stick around the outside edge (backs) of the folded circles, while they are still folded. Next, line up two circles, back to back, and press half of each circle to each other. Don't let the other halves touch together. 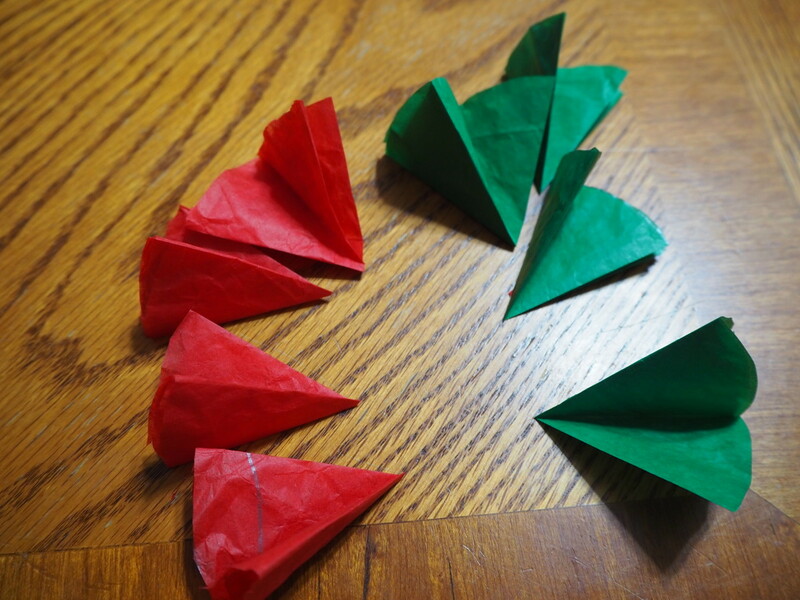 Now, take the third circle, and line it up with the others, and press the outside edges together, one edge to each of the already-glued circles, to create your 3-D ornament! Be very careful during this step that your pictures are all right-side-up to each other. You wouldn't want Santa doing a headstand, afterall! Or an upside-down tree! Note: when I was making these for purposes of this article, I found my glue stick had dried out and was useless. I substituted double-sided sticky tape, and it worked just as well. See the trimmed scraps? Sometimes, things don't line up perfectly. That's okay. Just trim off the excess. 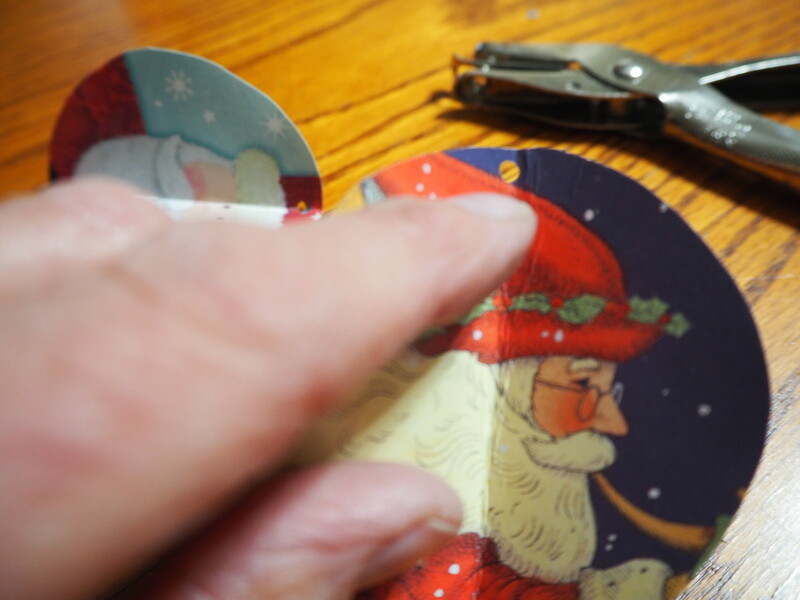 Using the paper punch (one with a small diameter hole is best, not a 'standard' one for punching binder paper), slightly flatten the finished ornament, and punch a hole in the top as near the center line as possible. This could be tricky, or require adult hand strength, especially if thick cards were used. Thread a loop of your twine through the hole, knot the ends together, and you're all done! 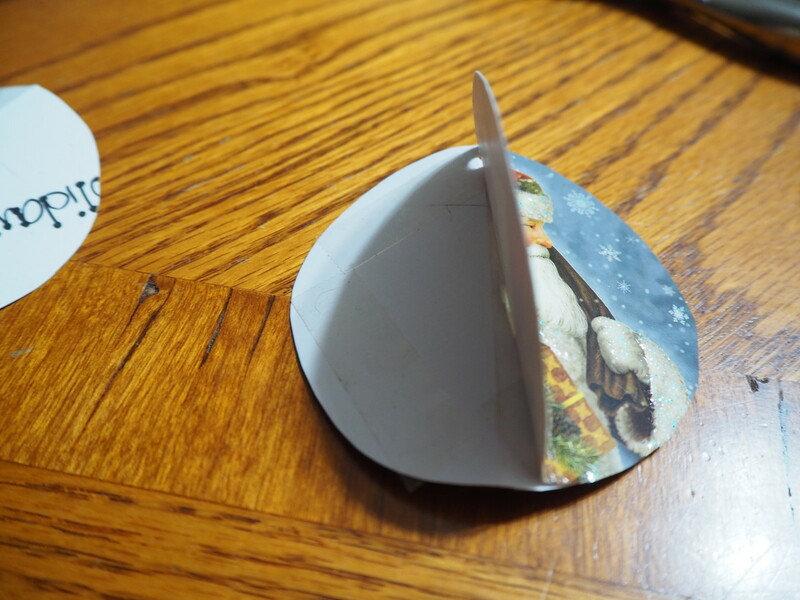 Use the paper punch to make a small hole in the top center of your ornament. 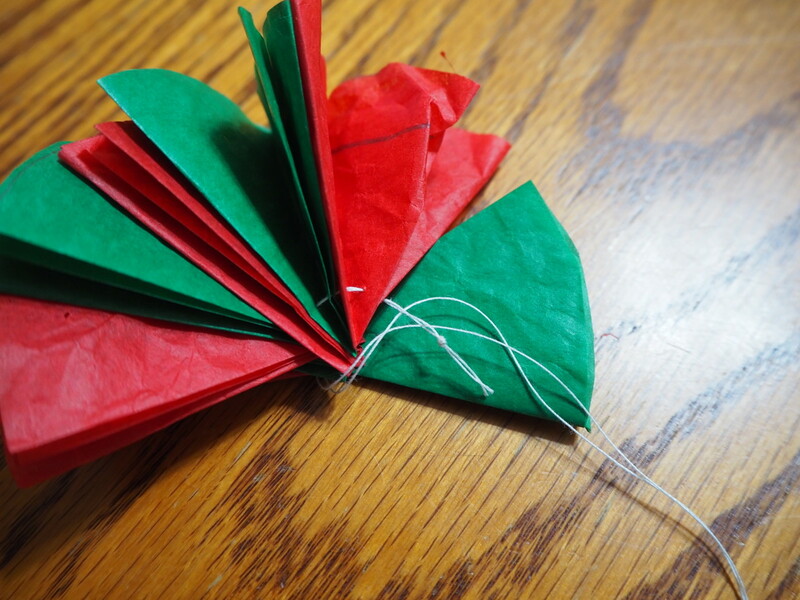 One important note: these are crafts that take longer to explain than to make, so don't be intimidated by all the steps and words. 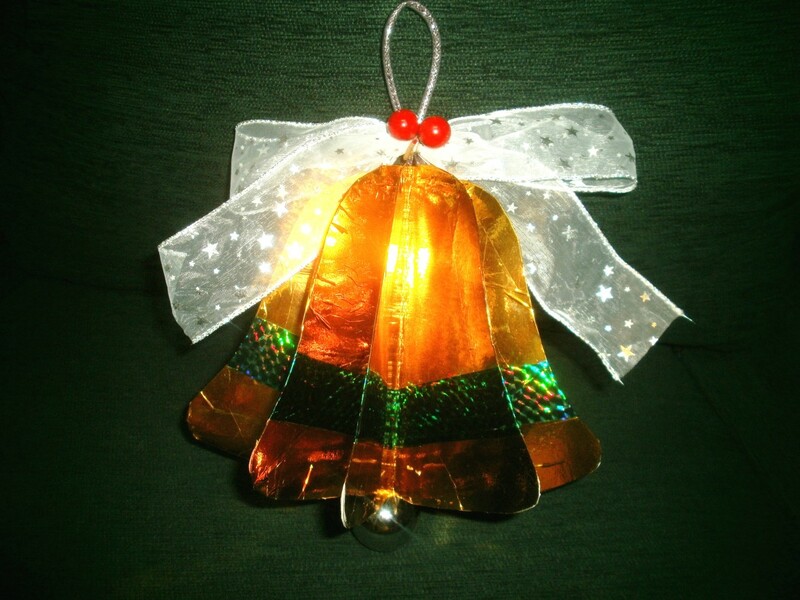 The best thing about these ornaments is that they are quick and easy to make, and can be done at the very last minute. It's a great way to keep the younger set out of everyone's hair while dinner preparations are made. After the ornaments are completed, you can then make quite a production of hanging them up wherever you like. It can even become a tradition. If you're going to keep them from year to year, you do need a sturdy box, like a shoebox, as they crush easily. 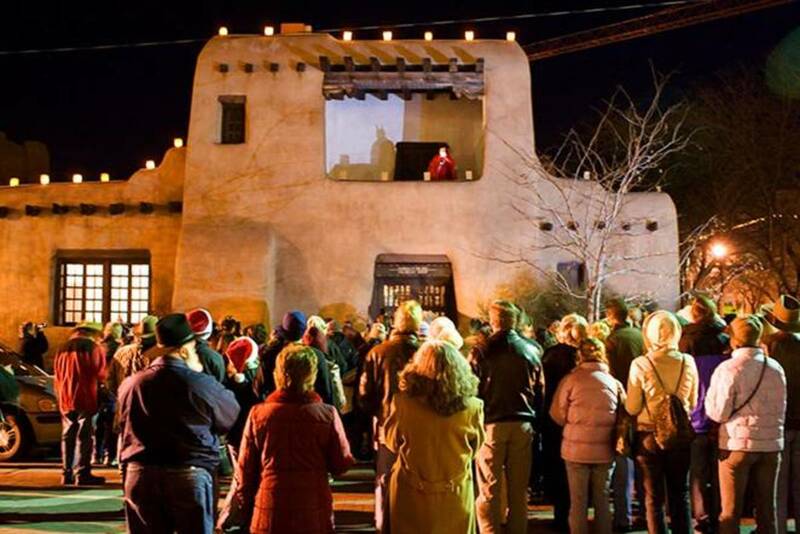 But if you don't keep them, you're not out much in the way of materials, and you can re-visit the fun next year. 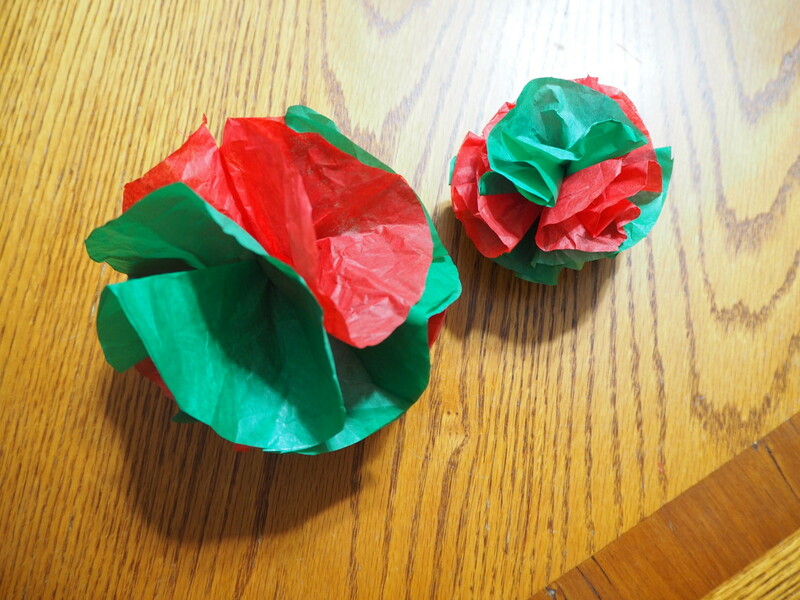 What cute ways to keep the kids occupied during holiday break! I especially like the 3-dimmensional card ornament. I'm so glad you found a new craft idea here. These are so easy, and so much fun to make! Thank you for the fun ornament ideas. 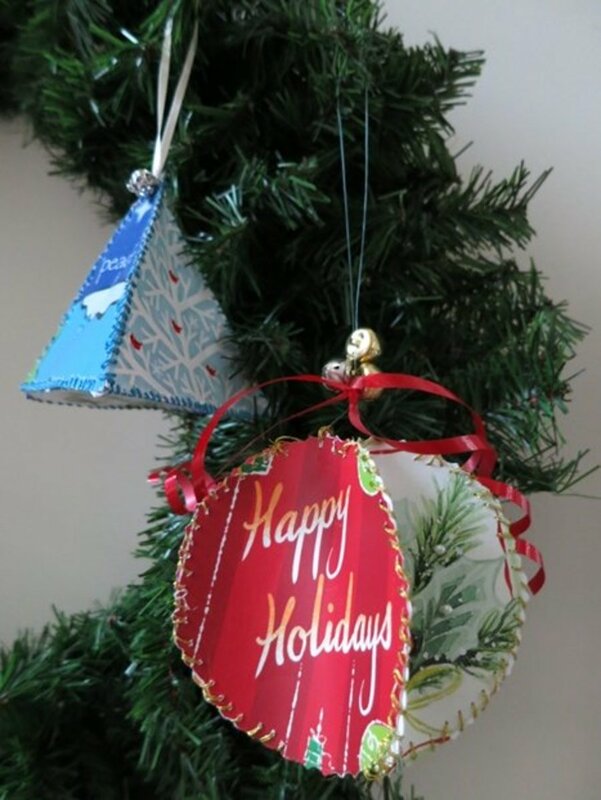 I especially like the 3-D ornaments using Christmas cards. I have been thinking how I would like to change things up this year, and you presented me with just the right change. 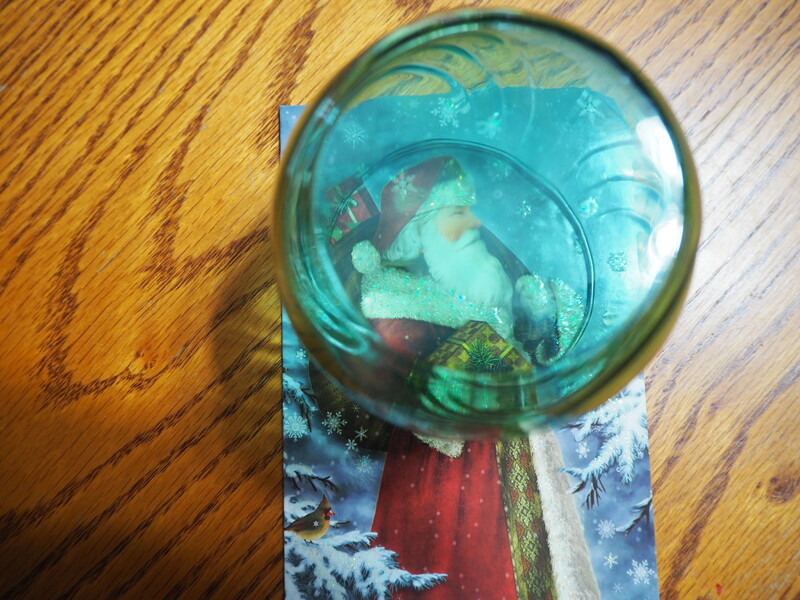 I have tons of old Christmas cards, and now I have just the perfect way to put them to use. 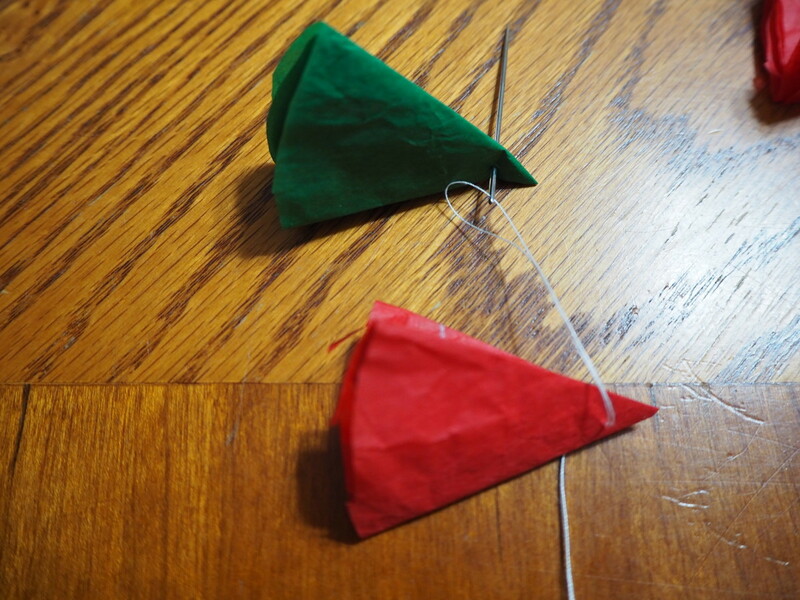 Yes, it was always a fun thing I did with my kids; passed down from my mom, for we made these when I was a youngster! Thanks much for stopping by, and I'm delighted you enjoyed this piece. What fun crafts, Liz! This way the young 'uns can take an active part in holiday celebrations without being under foot. The pride they would feel in their creations is an added bonus! @ Eric; Thanks for your comment, and yes, this is recycling 101 for sure. Good fun for the younger set. @ Liz; Thank you very much. I'm glad you liked this article. 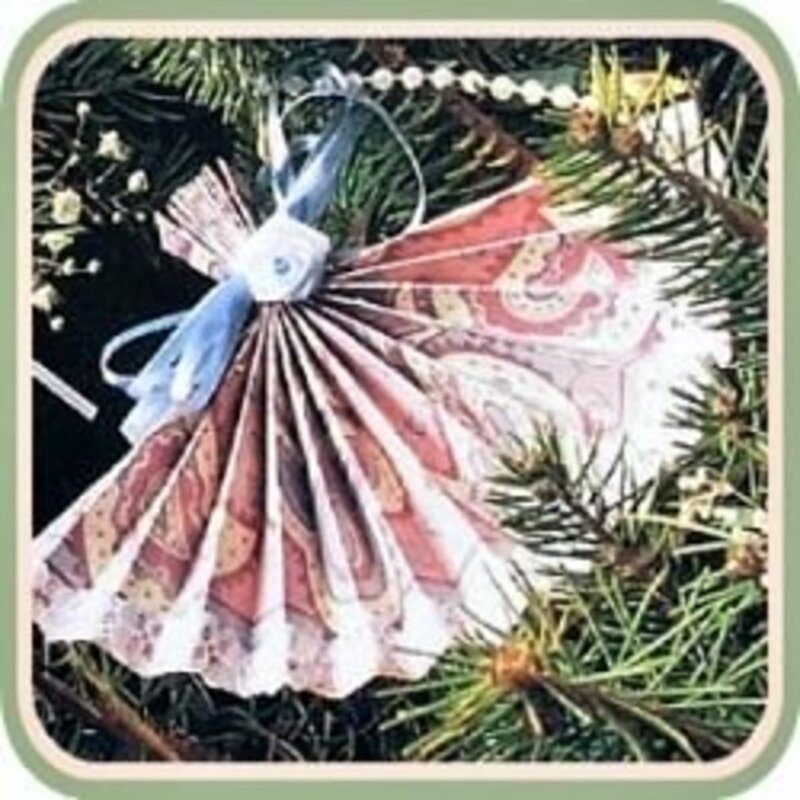 Great ideas and good instructions for seasonal decorations. Shall do. On one we learn recycling at it's best and the other - needle and thread and shapes, not to mention how fun and fun to send off to family. Thanks.